Pedestrians stroll down Mercaderes Street in Arequipa, Peru. Photo by Susan Cornejo. Jaime Huamaní was born and raised in Arequipa, the southern city of Peru, home to over 840,000 people. When he was young, he left to study in another city, where he eventually married and started a family. Fifteen years later, he returned to his hometown, Arequipa, with his family. Today, he enjoys an ice cream with his family at one of the busiest outdoor stores on la calle Mercaderes (Merchants Street), where, in the heart of Peruvian city, he can peacefully escape the noise and fumes of traffic. But just four years ago, before Humaní returned to Arequipa, this lively public space was a dirty parking lot in the middle of a chaotic street. In order to turn Mercaderes Street into the walkable zone it is today, planners and builders had to redesign the drainage system, reroute wiring, plant trees, and install the first intelligent traffic lights in Arequipa. They also worked to restore several historic buildings along the street, which were constructed with the white volcanic stone that characterizes the city. The project was inspired by similar public spaces in Quito and Guayaquil, Ecuador, and Bogota, Colombia. 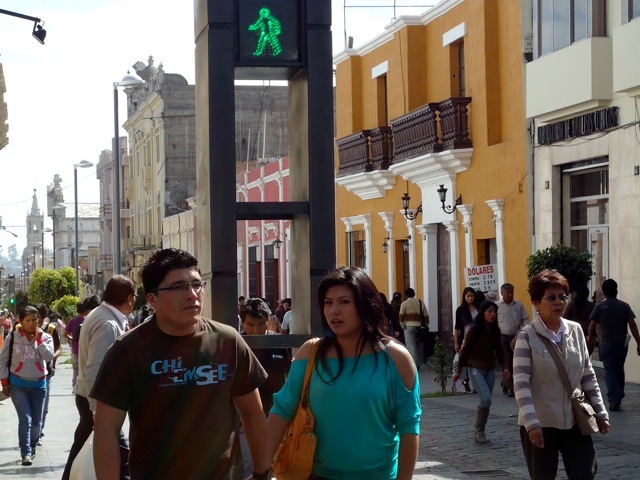 As the project began, authorities from Arequipa visited these locations during a trip facilitated by EMBARQ to understand the benefits of creating pedestrian areas. At the XIV Bienal de Arquitectura Peruana (Fourteenth Biennial of Peruvian Architecture) held in August 2010, Mercaderes Street received recognition in an award for best urban design in the urban planning category. This was an honor for not only the designers of the street, but for the entire city, and further proof that la calle Mercaderes has helped to transform Arequipa’s landscape. On the four-year anniversary of the street’s transformation, Jaime Huamaní watches his children run and play safely without the danger or pollution from traffic. He feels at peace with his decision to return to his hometown, for he knows Arequipa is a city where his children can grow and thrive.